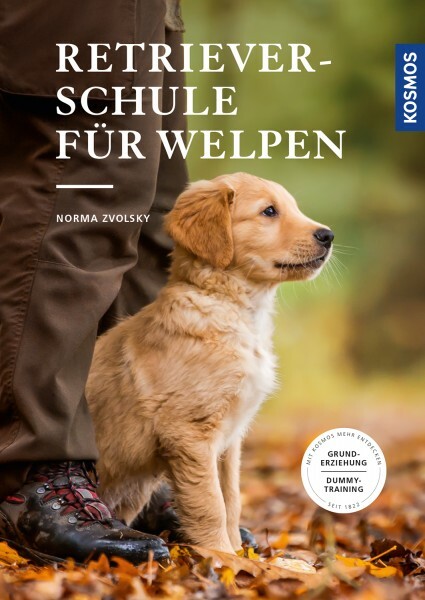 Product information "Retrieverschule für Welpen"
It has to be a retriever puppy! Yet how do you find a suitable breeder? How do you turn your apartment into a safe place for a puppy and how do you start with basic training? In order to prepare owners for their new lively addition to the family and to prevent the small fluffy creature from tearing the place apart, Norma Zvolsky offers important tips on keeping, training and playing with those intelligent and sportive dogs. She places particular emphasis on the proper training for all ages. The various steps and the dummy training consist of various levels, individually adjusted to the puppy’s stage of development. Norma Zvolsky has for many years been a keeper of retrievers, breeder of golden retrievers and is an experienced dog trainer. She is internationally successful with her dogs in tests of hunting dogs' use, as well as sports tests with dummies.